One of the most difficult tasks in football is getting Linebackers to have an effective pass drop. Linebackers, by their nature, are not great pass defenders. 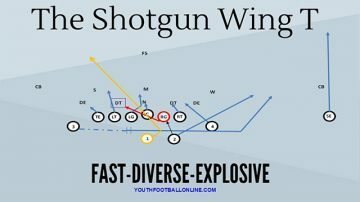 When they drop in Zone Coverage they are normally dropping in the middle of the field and have to prepare for receivers coming at them from both sides. The key to getting Linebackers to be effective in their Zone Drops is to give them a limited responsibility and a clear set of rules they can use to be effective. Coaching Linebacker drops is one of the most difficult tasks for a good linebacker coach. Linebackers must be downhill, run first players. If they are not stopping the run first, it is going to be a long game. As a result, the coach has to make sure he linebackers are making their full run read before they vacate the box and get to their drops. This has been made more difficult with the increase in popularity of 7 on 7 where linebackers are flying to their pass zones without ever coming up to make their reads. To give the Linebackers a clear read on if it is a pass or run the traditional rule has been to read the Guard. If the Guard’s helmet pops up and he moves back, you know that the offense is going to throw the ball, while if he fires out and starts moving forward you could assume it is going to be a run. This worked fine until Run Pass Options started and the offensive line would be run blocking while the Quarterback threw the ball downfield. To counter this we have the Linebacker read through the Guard to the backfield. If he gets a high hat from a Guard he knows that it is a pass, just like in the traditional rules, but if he gets a run read he needs to read to the backfield. He will read the Quarterback’s helmet. If the QB’s helmet is following the Running Back the Linebacker knows it must be a run because the Quarterback can’t be reading a defender. If the QB’s helmet is steady and locked onto something he will look for the ball to guarantee that it is a handoff before flying up to make the stop on the run. The hard part is finding a way for players to recognize this in the second or two they have to make a play on the ball. To work on this we moved to a drill that builds off the traditional Guard read drill and adds a second layer to it. When we know we are playing a team that uses Read Option we will have the two Guards set up but we will add a Quarterback and Running Back behind them. 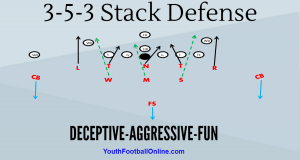 Our RPO Read Drill will add a second layer to the Linebackers reads. One thing that is universal is if they see the high hat of a pass protection they will get back to their pass zone. The major difference comes from when they see a low hat run read. If the linemen fire out, instead of coming directly downhill, they will check the Quarterback. If the Quarterback’s helmet is moving they will come down and fill their hole because it is a traditional run play where the Quarterback is not reading anyone. If the Quarterback’s helmet is fixed on a point and steady then the linebacker knows someone is being read and can give the response that the defense has been working for RPOs. This seems like a complex read for the linebacker, but like anything, with time it becomes second nature. The key is to get players lots of reps so they can build the muscle memory that is required to react to the different reads.